The Fetch of Mardy Watt is one of those almost-perfect books (there was just one tiny thread either loose or else to subtly tied I overlooked the knot) that manages simultaneously to remind me of my favourite books by several other writers. From the moment Mrs Watt's instruction to her daughter to be content with the body God gave her is followed up by her request to find Mrs Watt's own hair dye, it's obvious Charles Butler has a wicked eye for detail and for that oh-so-human talent for believing two or more mutually exclusive philosophies at the same time. The plot? Cranky and opinionated Mardy Watt is being replaced by a fetch; a replica; and there seems little she can do about it. She seeks help from her nerdish friend Hal (once court jester to her Queen Bee but now promoted to Loyal-and-possibly-only-real Friend) and endures a push/pull, fascination/dislike relationship with new girl Rachel Fludd. (And don't we always feel like that about someone who looks just the way we do, but better?) Rachel's French pun involving Mardy's name and the last Tuesday before Lent is an uncomfortable (for Mardy) echo of her Queen Bee days but though Mardy would like to lose weight she never expected to lose tangibility at the same time. And that's probably enough adverbs and adjectives for any review. Before I close though, I'll draw your attention to the cover. I think it's perfect. In my ongoing quest to create my own version of the best fifty books I've chosen to put up fifty-two posts, each showcasing one book I think stands tall among its peers and why I like it. I won't be adding any books in the spirit of "you should read/like/buy this book". It's all about the book, how we met and why I love it. 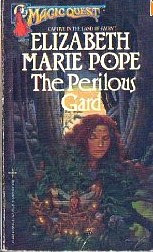 The Perilous Gard by Elizabeth Marie Pope. 1971. I was foraging in the second-hand book shop in Devonport's Four Ways. 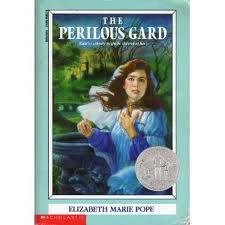 I turned up a book with MAGIC QUEST on the cover. The naff cover picture put me off, showing as it apparently did a curly-haired girl peering at a nest of fairies, but as I turned it over, a comment about unicorns and eggs alerted me. I recognised that as a reference to a book by Madeleine L'Engle. If this series included books by M-L, I reasoned, it couldn't be as cheesy as the picture implied. I read the book's own blurb and paid up my coin. I read the book with delight, and it immediately vaulted over almost every other book I'd ever read to reach the heights of my "favourites" list. I loved the lucid style with the lovely touches of detail that never overwhelm the story. 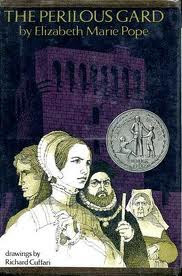 I loved the central character, Kate Sutton, a disgraced lady-in-waiting who took the fall for her sister's misdeed and who remained resolutely true to her self. I liked the low key romance, which included one of the oddest and most touching declarations of affection I have ever encountered. I liked the fact that so many of the characters wanted opposing things; they could have been enemies or "bad guys" but instead were simply honest people wanting the best for themselves and others. 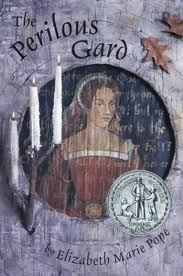 There's a Tam Lin theme running through the story, which also intrigued me, and the period - the 1550s - was familiar from books by Geoffrey Trease. I have since seen the same book in other covers (see above), all of which are more appropriate and pleasing than the first one I saw. And yet, seeing Kate dressed in the garments she probably would have worn might put off potential readers because she looks so stiff and doll-like. The fourth cover shows a much more accessible girl, wearing a stage-musical version of the costume. It's historically incorrect, but it might appeal to more readers. Naturally, I sought more books by my new favoured author and was disappointed to discover only one more; The Sherwood Ring, published in the late 1950s.